For me, who grew up reading Rediff news and using Rediff email for a long time, it hurts. It pains to see such news ‘items’ on display at one of India’s biggest web property. Are they trying to match Indiatimes.com standard of reporting? If they are, then I am afraid it’s the race to the bottom. As per Wikipedia entry, Rediff has around 95 million registered users! Such a waste of attention, love and care. I have time and again shared that managing a web property is entirely different from managing a company. No, popular blogs and websites like Rediff doesn’t require a manager to manage its resources but needs a leader to take forward the story we Indians love to read. Newspaper management with an army of editors and journalists would do no good to a website like Rediff but a passionate and loyal team of writers, dreamers and visualizers can help them turn around. 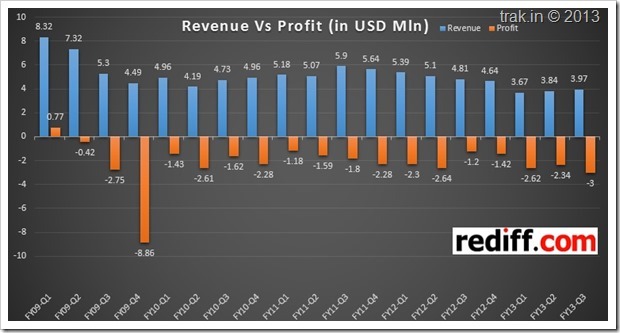 The last time Rediff made a profit was in the year 2008 (quarter ending June 30th), when they reported a revenue of $8.32 million, out of which $5 million came from online revenue itself. Today, it’s just a fraction of that! This means that for the last 18 quarters, Rediff is making loss. Continuously making loss on their investments and efforts. On May 22, 2013, Rediff announced their fiscal 2013 fourth quarter and year-end results and the news isn’t much encouraging. Their revenues of $4.18 million for the last quarter of 2012 is 10% lower compared to the same data for last year. As per the report, this decline was primarily driven by lower advertisement spending by Indian advertisers. For the last quarter ending December 31, 2012, Rediff had reporteda net loss of $3 million, which included a net loss of $2 million arising from the closure of India Abroad, a new offset which tried to launch but failed miserably. During the same period, their operating loss was $2 million. In short, Rediff is spending more that they are earning. And things don’t look good from here. Now, some positive news for Rediff fans. Although their net income is down, but their user base and advertising revenues have increased. They are taking full advantage of the Indian Internet growth story as overall advertising business in India grew 7 to 10% depending on the niche and market. Additionally, Rediff managed to expand their ecommerce marketplace with addition of more SKUs. As of now, they have a total SKU list of 184,000. Impressive! And to be fair, Rediff is trying to keep up. They have introduced iOS, Android and Blackberry apps and more users are reading Rediff stories compared to last year. But at the end of the day, it’s the money which is the honey. If Rediff is not able to rebound itself and declare more profit, then I am afraid this vibrant community will be reduced to once-upon-a-time website. If any Rediff management team member is reading this, then my humble request: Please give us more interesting, educative and stunning content. Advertisements and Revenues will take care of themselves! I believe Rediff has it in them to bounce back. I have been a regular visitor to their website, and once i open my browser, the first website that i visit, even today, is Rediff.com. Ofcourse, the current look seems to be inspired by Pinterest, which I believe shudn’t be for a news website of such a kind. They should revert to their older look. It was simple and got to the point. Back in 2006 I used to spend a good part of my time on Rediff discussing stocks with knowledgeable people. I made a lot of money in stocks. Since then the quality has gone down. When you say 95 million registered users, the figure is mouth watering. But I have a strong doubt that 95% of them are fake ids just to spread hatred in every article discussion boards. I strongly believe that majority of the registered users are chindi chor people who just spew venom in discussion boards. You cant expect any net worth having such user base. The losses are the proof. Its a long time I stopped even seeing the home page of rediff. I straight away go to the money section because, what ever their management, what ever stupid people discuss in articles, what ever the quality of the articles, the real time graphs of rediff are unmatched compared to any other financial site and analytical in deciding stock buys.. Some times I feel sorry for rediff, but as long as the management dont bother, why should we waste tears?